Sumi loves yoga so much it’s infectious. Growing up in Los Angeles, she dabbled in it regularly, but fell in love with the practice once she moved to Maryland. Initially drawn to yoga as a physical outlet, she began practicing regularly. Before long, she found peace, clarity, and stillness in her practice and is intrigued by the mind-body connection yoga has to offer. She believes yoga has a way of giving you what you want, but also sneaking in a lot of what you need. Sumi is RYT-200 trained through her teacher and mentor, Freddy Margolis. 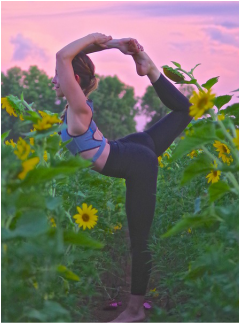 She believes in a hands-on approach to teaching and wants to help her students focus on breath, alignment, strength and flexibility while finding their edge on the mat!